by various sources. October 31, 2010. 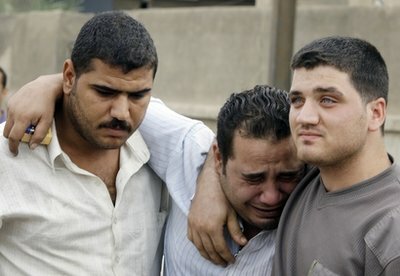 Iraqi Christians Mourn after Church Siege kills 58 (photographs) by Barbara Surk and Hamid Ahmed. Associated Press. 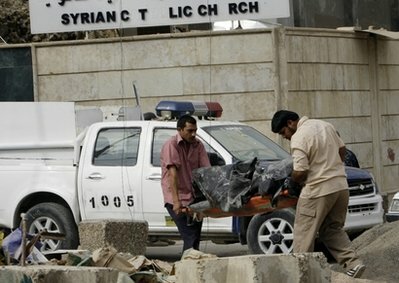 Baghdad Church Hostage Drama: Death Toll hits 58 (video) by Telegraph.co.uk. 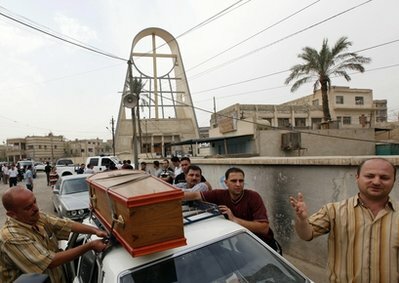 Baghdad Church Hostage Drama Ends in Bloodbath (analysis) by Jim Muir, BBC News. Iraqi Forces Free Hostages from Church; 58 killed by Lara Jakes, Associated Press (AP). 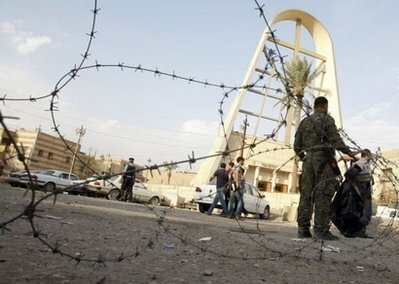 Siege at Baghdad Church Ends, 100 Hostages Freed by Lara Jakes, Associated Press (AP). 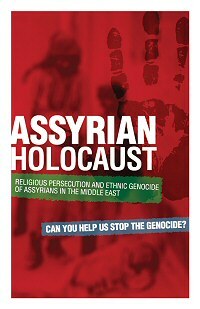 Assyrians worldwide are bringing attention to the religious persecution and ethnic genocide of Assyrians in the Middle East through peaceful Black Marches. A total of 58 hostages have been killed and scores injured during a shoot-out between US and Iraqi forces and al-Qaeda-linked gunmen in a Catholic church in Baghdad. by Our Foreign Staff, Telegraph.co.uk. Published: 7:00AM GMT 01 Nov 2010. There have been many attacks on Christians in Iraq since the US-led invasion of 2003, but nothing like this. At that time there were estimated to be around one million Christians from several ancient denominations - mainly Assyrian Nestorians, Chaldaeans and Syriacs. Their numbers are believed to have dwindled now to 600,000 or less. Many churches have been damaged by bombs in various parts of the country where Christians live - around Mosul in the north, Baghdad, and even Basra in the south. Christians have also been the victims of targeted killings, while priests and others have been abducted and murdered or ransomed. The exodus of Christian emigrants has continued despite the general improvement in Iraq's security in the past three years. The fear is that the carnage on Sunday night at the church of Our Lady of Salvation may speed up the flow of Christians seeking a better life elsewhere. by Jim Muir. BBC News, Baghdad. At least 52 people were killed as security forces stormed a Catholic church in Baghdad to free dozens of hostages, said Deputy Interior Minister Maj Gen Hussein Kamal. He suggested six attackers had also died in the fighting, though other sources have said the overall death toll was lower. Pope Benedict XVI has condemned the "absurd... ferocious violence". A statement was posted on a militant website allegedly run by the Islamic State of Iraq, a Sunni militant umbrella group to which al-Qaeda in Iraq belongs, claiming responsibility for the attack. The statement reportedly said Iraqi Christians would be "exterminated" if Muslim women in Egypt were not freed. It specifically mentioned two women in Egypt who radicals believe are being held against their will after converting to Islam. 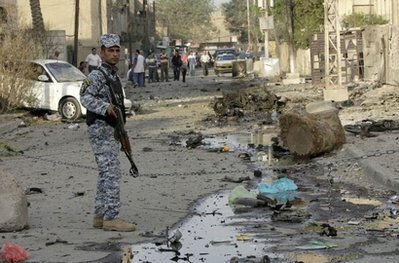 Residents of Baghdad's affluent Karada district, where the attack took place, first heard a loud explosion at about 1700 (1400 GMT) on Sunday, believed to have been a car bomb going off at the scene. About 100 people were inside Our Lady of Salvation for an evening Mass at the time. The blast was followed by gunfire as a group of armed men began by attacking the Iraq Stock Exchange building, police said, and then took over the Catholic church just across the road, clashing with guards and killing some of them. It seems the church was the attackers' real target, says the BBC's Jim Muir in Baghdad. One eyewitness, who was inside the church, said the gunmen "came into the prayer hall and immediately killed the priest". The witness, who declined to give his name, said worshippers were beaten and herded into an inne hall. There was an hours-long stand-off as security forces surrounded the building with helicopters hovering overhead. But the discussions got nowhere, our correspondent says, and the security forces stormed the church. Witnesses nearby said they then heard two explosions from inside the church and more shooting. The gunmen reportedly threw grenades and detonated their suicide vests. Maj Gen Hussein Kamal said 52 "martyrs" had died in the fighting, along with six attackers, though a police source earlier said 37 people - worshippers, security forces and attackers - had been killed. The number of wounded are put at between 56 and 62 - many of them women. Pope Benedict XVI denounced the attack as he gave a holiday blessing on Monday. He said two priests had died in the siege, though it was unclear whether both were killed in the initial attempt to take hostages or during the raid by security services. He said he was praying for the victims "of this absurd violence, made more ferocious because it was directed against unarmed people gathered in the house of God". He called for a new effort to end the violence. Iraqi Defence Minister Abdul-Qadr al-Obeidi said security forces approached the building at ground level and from the air. "We took a decision to launch a land offensive, and in addition an airdrop, because it was impossible to wait - the terrorists were planning to kill a large number of our brothers, the Christians who were at Mass," said Mr Obeidi. "So the operation was successfully done. All terrorists were killed. And we now have other suspects in detention." Witnesses say they saw US troops on the ground and US military helicopters hovering above the scene, but the extent of their involvement is not yet clear. Many churches have been bombed in recent years - including Our Lady of Salvation in August 2004 - and priests kidnapped and killed, but there has never been a prolonged hostage situation like this before, our correspondent says. Christians - many from from ancient denominations - have been leaving Iraq in droves since the US-led invasion in 2003, and about 600,000 remain. by Lara Jakes, Associated Press. 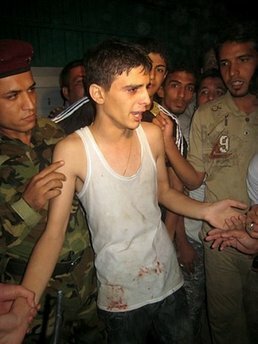 BAGHDAD, Iraq — Islamic militants held around 120 Iraqi Christians hostage for nearly four hours in a church Sunday before security forces stormed the building and freed them, ending a standoff that left at least 19 people dead, U.S. and Iraqi officials said. Security officials said the militants, who were allegedly linked to al-Qaida in Iraq, were on the phone with Iraqi authorities demanding the release of imprisoned female insurgents when security forces stormed the building. The standoff began at dusk when the militants attacked the nearby Iraqi stock exchange, officials said. Police then chased the insurgents toward the Our Lady of Deliverance church — one of Baghdad's main Catholic places of worship. Worshippers inside were listening to a Bible reading when the gunmen burst in, said parishioner Marzina Matti Yalda. "As we went outside the hall to see what was happening, gunmen stormed the main gate and they started to shoot at us," Yalda said. "Many people fell down, including a priest, while some of us ran inside and took shelter in a locked room. We were packed together as we waited for the security forces to arrive." A U.S. Army spokesman, Lt. Col. Eric Bloom, said at least 19 people were killed — seven hostages, seven Iraqi security troops and five militants. He said the assailants were wearing suicide vests and armed with grenades. As many as 30 people were wounded, including a priest and a nun, he said. 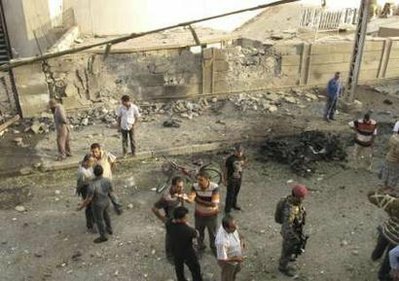 Iraqi military officials said the death toll was at least nine, while police and medical officials put it as high as 37. The figures could not be immediately reconciled. There were also conflicting reports about the militants' fate. An Iraqi police official put the number of insurgents at 10 and said all were captured. And Baghdad military spokesman Maj. Gen. Qassim al-Moussawi said security forces killed eight attackers, while the U.S. military said between five and seven attackers died. Different figures are normal immediately following such attacks. Iraqi Defense Minister Abdul-Qadir al-Obeidi said "the terrorists were planning to murder the highest number of hostages." Across Iraq, security forces were alerted to new threats against Christians. A cryptically worded statement posted late Sunday on a militant website allegedly by the Islamic State of Iraq appeared to claim responsibility for the attack. The group, which is linked to al-Qaida in Iraq, said it would "exterminate Iraqi Christians" if Muslim women are not freed within 48 hours from ministries and churches run by the Christian Coptic church in Egypt. The message's authenticity could not be immediately verified. Iraqi Christians, who have been frequent targets for Sunni insurgents, have left in droves since the 2003 U.S.-led war. Some 1.25 million Christians, 80 percent of them Catholic, used to live in Iraq. There are an estimated 870,000 left today. "The government shoulders some responsibility when it fails to protect its citizens," said Younadam Kanna, an Iraqi parliamentarian who is Christian. "Despite all of these terrorist attacks against the Christians, we are determined not to leave our country. And we will not be intimidated." A senior Iraqi intelligence official, speaking on condition of anonymity, said the insurgents called military forces and demanded the release of women prisoners linked to al-Qaida in Iraq, including an Egyptian woman whom they named. 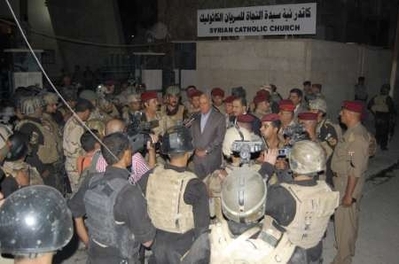 An Iraqi police official said security forces stormed the church while the insurgents were on the phone. The U.S. military said American forces provided air support only. Earlier this year, the U.S.-based National Council of Churches warned the State Department that Iraq's political deadlock could pose a threat to the nation's Christians if they get caught between Shiites and Sunnis competing for political power following inconclusive elections in March. Nearly eight months after the vote, Iraqi officials have yet to settle on a power-sharing agreement or choose new leaders — a delay that many fear could undermine the country's still fragile security. Political leaders seemed no closer to an agreement Sunday, even feuding over an offer from neighboring Saudi Arabia — a Sunni Arab power — to help broker a deal. The Shiite faction led by Iraqi Prime Minister Nouri al-Maliki rebuffed the Saudi initiative — despite welcoming assistance from Iran, the region's Shiite power. 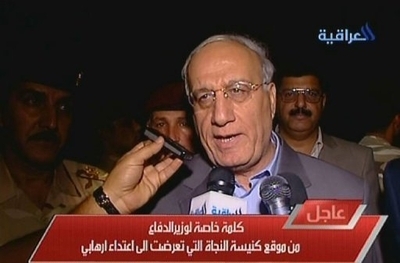 Al-Maliki's chief rival, the Iraqiya list, has welcomed the Saudi offer. Iraqiya drew heavily on Iraq's Sunni minority to narrowly defeat the prime minister's bloc in the March elections. With its power and money, Saudi Arabia commands wide influence over Sunni Arab states. But its leadership has asked that Iraqi leaders meet in Riyadh in mid-November at the earliest — extending a process that most feel has already gone on long enough. 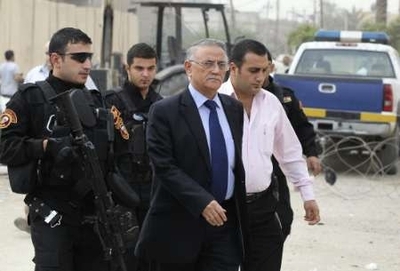 "The Iraqis are always asking where are the Arab initiatives, where are the Arab efforts? This is it," Saudi Foreign Minister Saud al-Faisal told reporters in Riyadh. He said the kingdom was not looking to meddle in Iraqi internal affairs and sought only to help broker an agreement: "We have no objective but to help." Associated Press Writers Barbara Surk, Rebecca Santana and Mazin Yahya in Baghdad; Sameer N. Yacoub in Amman, Jordan, and Qassim Abdul-Zahra in Boston contributed to this report. 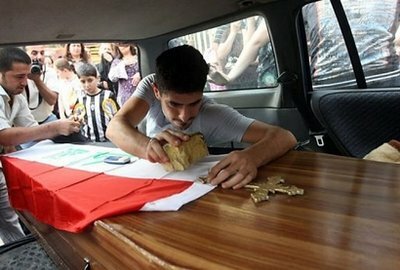 An Iraqi man hammers a cross and a national flag into the coffin of a relative in central Baghdad. Grieving Catholics in Baghdad marked All Saints Day Monday in mourning. 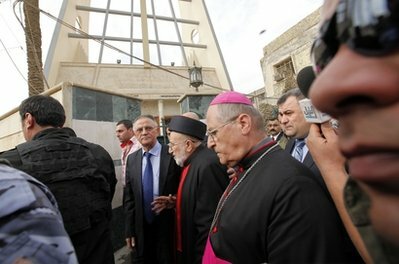 Iraqi Christian lawmaker, Younadam Kanna, center left, Iraq's top Catholic prelate, Chaldean Cardinal Emmanuel III Delly, center, and Bishop Shlimone Wardoni, center right, are seen outside Our Lady of Deliverance church the morning after its congregation was taken hostage in Baghdad, Iraq, Monday Nov. 1, 2010. Younadam Kanna, a Christian lawmaker visits Our Lady of Salvation church, a day after where gunmen held hostages, in Baghdad November 1, 2010. 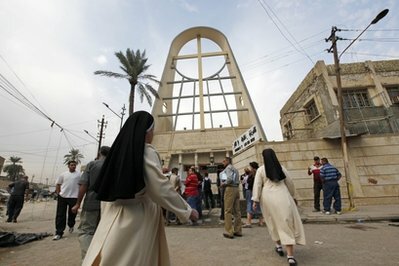 Nuns and bystanders are seen outside a Syrian Catholic church in Baghdad, Iraq, Monday Nov. 1, 2010 after its congregation was taken hostage late Sunday night. 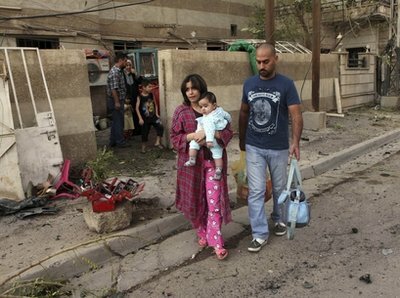 An Iraqi family leaves its destroyed home after a car bomb attack in front of a Syrian Catholic Church, in Baghdad, Iraq, Monday Nov. 1, 2010. Our Lady of Salvation Church doors in Baghdad, Iraq. by Barbara Surk and Hamid Ahmed. Associated Press, November 1, 2010. 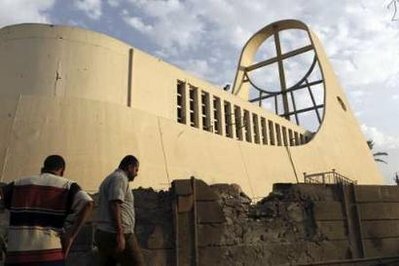 BAGHDAD – Iraq's dwindling Christian community was grieving and afraid on Monday after militants seized a Baghdad church during evening Mass, held the congregation hostage and triggered a raid by Iraqi security forces. The bloodbath left at least 58 people killed and 78 wounded — nearly everyone inside. The attack, claimed by an al-Qaida-linked organization, was the deadliest ever recorded against Iraq's Christians, whose numbers have plummeted since the 2003 U.S.-led invasion as the community has fled to other countries. 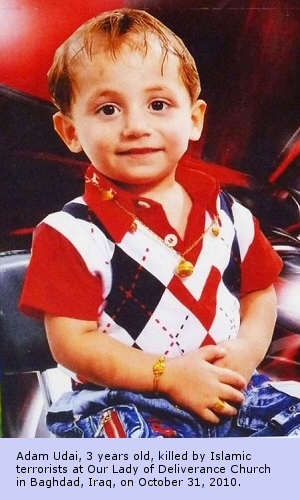 Outside Our Lady of Salvation church, Raed Hadi leaned against the car carrying his cousin's coffin, waiting for the police to let him bury him on church grounds. "It was a massacre in there and now they are cleaning it up," he said Monday morning. "We Christians don't have enough protection. ... What shall I do now? Leave and ask for asylum?" "Now they make a show," said Jamal Jaju, who watched as Iraqi forces pushed back observers. "What can I say? I lost at least 20 friends in there." Pope Benedict XVI denounced the assault as "ferocious" and called for renewed international efforts to broker peace in the region. Prime Minister Nouri al-Maliki also condemned the siege, saying it was an attempt to drive more Christians out of the country. Islamic militants have systematically attacked Christians in Iraq since the collapse of Saddam Hussein's regime, effectively chasing more than 1 million people out of the country, according to estimates from an adviser to Iraq's top Catholic prelate, Chaldean Cardinal Emmanuel III Delly. He shared the figures with The Associated Press on condition of anonymity because he was not authorized to talk to the media. In an interview, the cardinal encouraged the country's remaining 1.5 million remaining Christians not to be driven off by the militants. 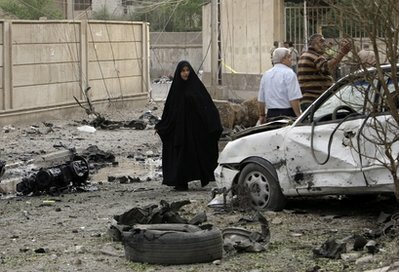 Sunday's carnage began at dusk, when a deadly car bomb went off in the area. Militants wearing suicide vests and armed with grenades then attacked the Iraqi stock exchange, injuring two guards. The car bombing and the attack on the stock exchange may have been an attempt by the militants to divert attention from their real target — the nearby church in an upscale Baghdad neighborhood. Others, however, questioned whether the raid was wise. Younadam Kanna, a Christian member of the Iraqi parliament, condemned the operation as "hasty" and "not professional." "We have no clear picture yet whether the worshippers were killed by the security forces' bullets or by terrorists, but what we know is that most of them were killed when the security forces started to storm the church," Kana said. About 4 1/4 hours passed between the car bombing and the end of the siege shortly after 10 p.m., said an American military official, who spoke on condition of anonymity because he was not authorized to discuss the matter. A cryptically worded statement posted late Sunday on a militant website allegedly by the Islamic State of Iraq appeared to claim responsibility for the attack. The group, which is linked to al-Qaida in Iraq, said it would "exterminate Iraqi Christians" if Muslim women in Egypt were not freed. It specifically mentioned two women that extremists maintain have converted to Islam and are being held against their will in Egypt. Iraqi authorities on Monday took extra measures to protect Christian neighborhoods and churches in Mosul, Kirkuk and Baghdad. Additional police cars and checkpoints were seen near many churches, and authorities were conducting extensive searches on cars and pedestrians heading to churches. "This is more than a tragedy," said Iraq's Human Rights minister, Wijdan Mikheil, who is a Christian. Choking back tears as she spoke with reporters outside Our Lady of Salvation church, she said: "What is happening to Iraqis in general and Christians in particular is an attempt to push them out of the country, but we hope Iraqis remain united." Our Lady of Salvation is a Syrian Catholic church. "Iraqi militias threatened me, saying I was on the side of the Americans because I am Christian," Karim told the AP. "They said I would be killed if I stayed in Iraq." 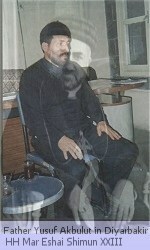 Now he lives in Damascus with his wife and five children. "I have left behind my house and everything to escape with my family," he said. Many other Iraqi Christians living in Syria refused to speak to the AP. They said they fear militias may exact revenge on their families in Iraq. Associated Press writers Albert Aji in Damascus, Syria, Sinan Salaheddin and Lara Jakes in Baghdad, Sameer N. Yacoub in Amman, Jordan and Qassim Abdul-Zahra in Boston contributed to this report. by Lara Jakes, Associated Press. November 1, 2010. Baghdad — Islamic militants held around 120 Iraqi Christians hostage for nearly four hours in a church Sunday before security forces stormed the building and freed them, ending a standoff that left at least 19 people dead, U.S. and Iraqi officials said. "As we went outside the hall to see what was happening, gunmen stormed the main gate and they started to shoot at us," Yalda said. A U.S. Army spokesman, Lt. Col. Eric Bloom, said at least 19 people were killed — seven hostages, seven Iraqi security troops and five militants. He said the assailants were wearing suicide vests and armed with grenades. As many as 30 people were wounded, including a priest and a nun, he said. 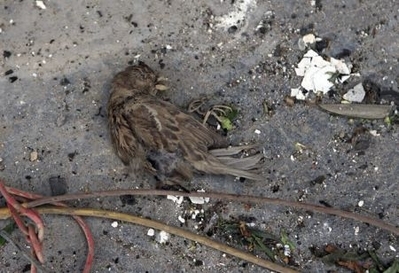 Iraqi military officials said the death toll was at least nine, while police and medical officials put it as high as 37. The figures could not be immediately reconciled. André Anton, 26, of Farmington Hills was angered to learn two of his second cousins were killed in the attack. "I got a call from my mom earlier (Sunday) and she was crying," said Anton, who made a short documentary, "Defying Deletion" about the violence against civilians in post-war Iraq. Killed in the attack, Anton said, were Thayr Abdal, 32, a priest, and his brother, Raid Abdal, 36. Robert Cohen, executive director of the Jewish Community Relations Council of Metropolitan Detroit, said in a statement, "We extend our profound condolences to our Chaldean neighbors … People of all faiths must stand together in condemning such a brutal, cowardly act." Detroit News Staff Writer Marisa Schultz contributed. These advertising and marketing media have been created to promote online campaigns and local community events. Feel free to copy, distribute, and print the high-resolution banner and PDF posters at your local printing store and display them in your campaigns. Click on the poster images to view and download the high resolution files.